Amir Jamaat-e-Islami (JI) Siraj ul Haq has begun preparations for the impending general elections, asking Lahore based members of JI to bring together a voter base of at least 1 million people in the city. Coming fresh off a successful rally in the Punjab Capital on the occasion of Kashmir day, the senator seems to have his hopes up. 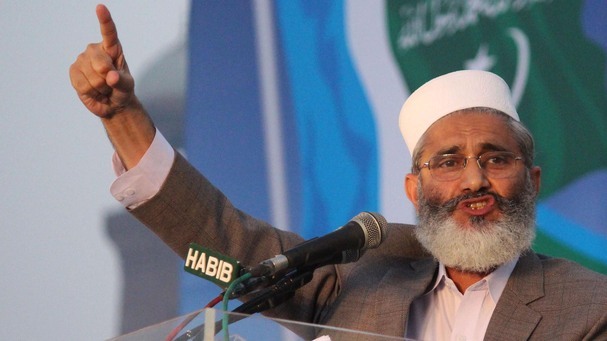 Sources report that he has asked every member of the JI to bring at least 10,000 voters into the party’s vote bank. Giving party workers a daunting time frame of 6 months to complete this task, Siraj ul Haq seems dedicated to this seemingly impossible feat, stressing upon his followers to immediately begin a door-to-door campaign seeking votes in every corner of the City. The JI has divided the city into five zones for logistical efficiency. Using the JI March on Kashmir day for political leverage, Siraj ul Haq had said on Sunday that the Kashmiri struggle “is an ideological war and nobody can defeat it.” Criticising the Federal government, Siraj ul Haq further claimed that the government had betrayed the Kashmiri people in favour of befriending India. Before this, the Senator had warned Prime Minister Nawaz Sharif that he was facing the embarrassment of the Panama leaks because he had gone back on his campaign promises to implement Sharia law in the country. The JI Amir seems to be aiming for more seats in the National assembly than it gained in the 2013 elections, in which its performance was dismal considering the sweep right-wing parties made in the polls.